Marking the 67th anniversary of the atomic bombing of Hiroshima, Secretary-General Ban Ki-moon today urged countries to work together to eliminate the threat of nuclear weapons and stressed the importance of honouring victims and survivors by sharing their stories with new generations. “There must never be another nuclear attack – never. The elimination of such weapons is not just a visionary goal, but the most reliable way to prevent their future use,” the UN chief stressed in his message, delivered on his behalf by the UN High Representative for Disarmament Affairs, Angela Kane. According to the city’s official website, the Peace Memorial Ceremony is held, in front of the Hiroshima Peace City Memorial Monument, to appease the souls of those killed by the atomic bomb and to pray for eternal peace on Earth. During the ceremony, the Peace Declaration, which appeals for the abolition of nuclear weapons and for the realization of eternal world peace, is delivered by the Mayor of Hiroshima City and is transmitted worldwide. Over 400,000 people have died – with more continuing to die – since the end of the Second World War from the impacts of the bombings in Hiroshima, as well as the city of Nagasaki, which was bombed three days after Hiroshima. Mr. Ban highlighted the importance of making the stories of the hibakusha – as the victims of the bombings are known – heard throughout the world, to raise awareness of the effects of nuclear weapons and the need to eliminate them. The website, which was jointly produced by the UN Office of Disarmament Affairs and Japanese artist and director Shinpei Takeda, showcases over 60 interviews with survivors who travelled to America after the bombings in an attempt to highlight the long-term impact of weapons of mass destruction. Mr. Ban has made nuclear disarmament and non-proliferation a top priority. In 2008, he put forward a five-point plan that includes recommendations on increasing security, verification, and establishing a legal framework for nuclear disarmament, transparency and conventional weapons. In a message to the 2012 World Conference against Atomic and Hydrogen Bombs, held after the Hiroshima Peace Memorial Ceremony, Secretary-General Ban emphasized that achieving a future without nuclear weapons would require international cooperation and called on countries to work towards this goal. 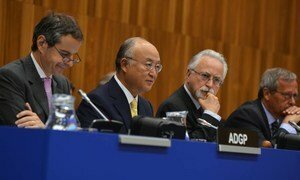 “[Nuclear disarmament] will require hard work and the collaboration of a wide variety of individuals and groups throughout the international community. It will require close cooperation between groups of States, and it will require a central focus at the United Nations,” Mr. Ban said in the remarks delivered by Ms. Kane.